New York Comic Con is almost here, and Bottleneck Gallery is going to have an amazing line up of exclusive releases. Check out this wonderful New York Comic Con 2018 Exclusive Rock and Morty Screen Print by Dave Perillo! 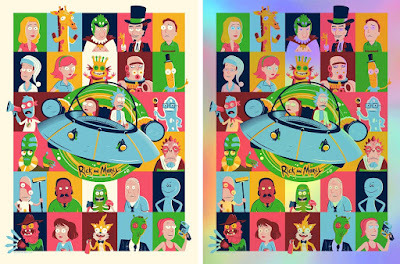 This hand numbered Rick and Morty print measures 18”x24” and will be available in two editions. The Regular Edition is limited to 125 pieces and will retail for $40, while the Foil Variant is limited to 50 pieces and will retail for $50. Fans can purchase both versions at the Bottleneck Gallery NYCC booth #2160.